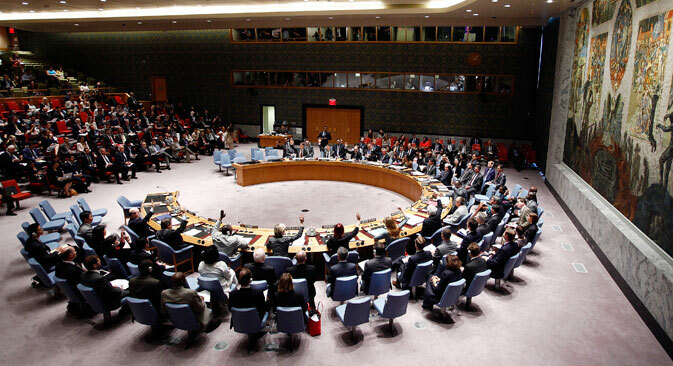 The United Nations Security Council has unanimously adopted a resolution on the downing of MH17 in eastern Ukraine, condemning “in the strongest terms” the actions that led to the crash and calling for “a full, thorough, and independent international investigation into the incident.” However, a number of member countries, including the U.S., the Netherlands and Australia, have criticized Russia for not doing enough to prevent pro-autonomy militants from compromising the integrity of the crash site. Russia has backed a resolution by the United Nations Security Council on the Malaysia Airlines Boeing 777 that was apparently shot down in eastern Ukraine. Support for the vote, which took place on July 21, was unanimous. The document condemns, “in the strongest terms,” the actions that led to the crash and stressed "the need for a full, thorough, and independent international investigation into the incident in accordance with international civil aviation guidelines." The draft resolution was submitted to Australia, which lost 27 of its citizens in the tragedy, for review. In the document, the UN Security Council demands "that all military activities, including by armed groups, be immediately ceased in the immediate area surrounding the crash site to allow for the security and safety of the international investigation." The document also stressed the need to grant the “Organization for Security and Cooperation in Europe (OSCE) Special Monitoring Mission and representatives of other relevant international organizations” access to the crash site, as well as to organize safe work for the specialists. At the meeting, the representatives of a number of nations, including the Netherlands and Australia, which lost 193 and 27 citizens respectively in the disaster, applauded Russia for supporting the UN resolution, but challenged it to act responsibly by asserting its influence over the pro-autonomy militias currently in control of the crash site. “Russia has been outspoken on other matters,” she continued. In response, Russia’s ambassador to the UN Vitaly Churkin defended Russia’s conduct and said that there was “no need to turn a tragedy into a farce." "Perhaps Washington is unaware of the efforts which Russia has undertaken, in particular as part of the contact group, to ensure that international experts could arrive on the scene of the catastrophe as fast as possible. If this is so, then the American embassy should be better informed,” said Churkin. The Chinese Permanent Representative to the UN, Liu Jieyi, also noted the importance of a leading role for the ICAO during the investigation. “Until that happens, none of the parties should believe any conclusion or get involved in building mutual accusations,” the Chinese diplomat said.